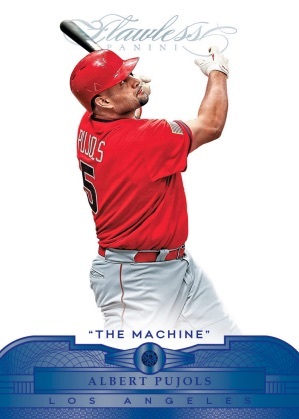 Back for another super-premium run, 2017 Panini Flawless Baseball is all about the hits, whether it's gemstone cards, on-card autographs, cut sigs or top-shelf memorabilia. Every box comes packed with six autographs, two relics and two jewel base cards. 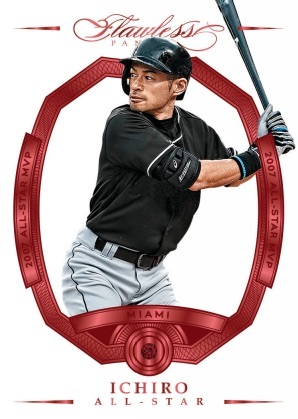 Following the 2016 debut, the 2017 Panini Flawless Baseball checklist promises "more all-stars, legends and superstars than ever before," and that includes a gentleman by the name of Mickey Mantle. Starting with the base cards, 2017 Panini Flawless Baseball presents bejeweled designs with options like diamonds, sapphires or rubies. 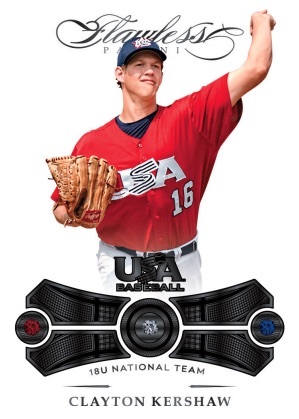 All limited to 20 copies or less, base themes include All-Stars, Alma Mater, Milestones, Nicknames, and the triple-gem USA Baseball. 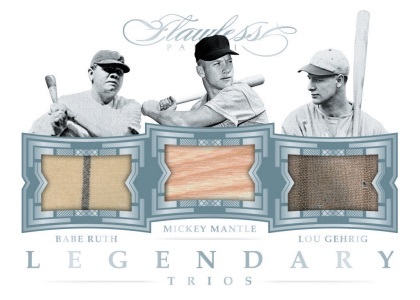 That variety goes to good use, as Mantle has four different base cards to collect. The jewel cards are nice, of course, and do give the base set more excitement, but 2017 Panini Flawless Baseball also has plenty of autographs that are sure to catch an eye or two. The Rookie Patch Autograph and Dual Rookie Patch Autograph sets, each numbered to 25 or less, naturally cater to the rookie collectors, incorporating on-card autographs and prime swatches for some of the top young talent. However, it's not only rookies who get this treatment, as the Patch Autograph insert features past and present stars in a similar design. Flawless Finishes is another hard-signed set of note in 2017 Panini Flawless Baseball, with many additional numbered autographs in play. 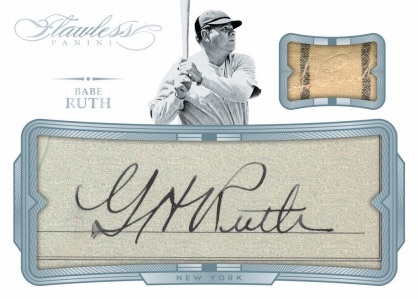 Digging deep into the all-time legends of the game, Flawless Cuts Memorabilia pairs a cut signature and relic for a former legend. "The Mick" himself has 20 cut sigs to chase in the set. Finally, 2017 Panini Flawless Baseball hobby boxes contain two relic cards, including options like Material Greats, Legendary Trios and Triple Memorabilia. These are mock-up cards. Designs and contents subject to change. NOAH SYNDERGAARD 2017 PANINI FLAWLESS AUTO #'d 15 NEW YORK METS !! 2017 FLAWLESS GARY SANCHEZ TREVOR STORY AUTO. SSP 3 5 GREEN FOIL. 106 cards. Serial numbered #/20. Exclusive to 1st Off The Line boxes (FOTL). CARD VERSIONS: Ruby #/20 or #/10, Sapphire #/15 or less, Gold #/10 or less, Emerald #/5 or less, Black 1/1. All subjects not included in Ruby/Sapphire/Gold parallels. View specific options with the spreadsheet. Yoan Moncada (card #2) only in Emerald/Black parallels. CARD VERSIONS: Ruby #/20 (No Happ, Bellinger*), Sapphire #/15 (No Happ, Bellinger*), Gold #/10, Emerald #/5, Black 1/1. CARD VERSIONS: Ruby #/20 or #/15, Sapphire #/15 or #/10, Gold #/10 or less, Emerald #/5, Black 1/1. All subjects not included in Ruby/Sapphire parallels. View specific options with the spreadsheet. CARD VERSIONS: Ruby #/20 or less (No Tebow)*, Sapphire #/15 or less (No Tebow)*, Gold #/10 or less, Emerald #/5 or less, Black 1/1. PARALLEL CARDS: Ruby #/20, Sapphire #/15, Gold #/10, Emerald #/5, Black 1/1 (No Josh Bell*). MARGOT/RENFROE PARALLELS**: Ruby #/10, Sapphire #/7, Gold #/5, Emerald #/3, Black 1/1. CARD VERSIONS: Ruby #/20 or less, Sapphire #/15 or less (No Dawson/Rodriguez*), Gold #/10 or less, Emerald #/5 or less, Black 1/1. All subjects not included in Ruby parallels. View specific options with the spreadsheet. PARALLEL CARDS: Ruby #/20 or less, Sapphire #/15 or less, Gold #/10 or less, Emerald #/5 or less, Black 1/1. CARD VERSIONS: Ruby #/20 or less (No Ripken, McCutchen, Votto, Sandberg*), Sapphire #/15 or less (No McCutchen*), Gold #/10 or less, Emerald #/5 or less, Black 1/1. CARD VERSIONS: Ruby #/20 or less (No Rodriguez*), Sapphire #/15 or less (No Rodriguez*), Gold #/10 or less, Emerald #/5 or #/3, Black 1/1. CARD VERSIONS: Ruby #/20 or less, Sapphire #/15 or less, Gold #/10 or less, Emerald #/5 or #/3 (No Helton*), Black 1/1. CARD VERSIONS: Ruby #/20 or less, Sapphire #/15 or less (No Gooden, Rodriguez*), Gold #/10 or #/5, Emerald #/5 or #/3, Black 1/1. All subjects not included in Ruby parallel. View specific options with the spreadsheet. CARD VERSIONS: Ruby #/20 or #/10, Gold #/10 or less, Sapphire #/7 (Card #5 - #/15**), Emerald #/5 or #/3, Black 1/1. All subjects not included in Ruby/Gold/Sapphire parallels. View specific options with the spreadsheet. PARALLEL CARDS: Ruby #/20 or less (No Cobb, Banks*), Sapphire #/15 or less (No Banks*), Gold #/10 or less, Emerald #/5 or less, Black 1/1. CARD VERSIONS: Ruby #/20 or #/10, Sapphire #/15 or #/7, Gold #/10 or #/5, Emerald #/5 or #/3, Black 1/1. CARD VERSIONS: Ruby #/20 or less, Sapphire #/15 or less, Gold #/10 or #/5, Emerald #/5 or #/3, Black 1/1. All subjects not included in Ruby/Sapphite parallels. View specific options with the spreadsheet. CARD VERSIONS: Ruby #/20 or less, Sapphire #/15 or less, Gold #/10 or less, Emerald #/5 or less (No Sale*), Black 1/1. CARD VERSIONS: Ruby #/20 or less, Sapphire #/15 or #/7, Gold #/10 or #/5, Emerald #/5 or #/3, Black 1/1. CARD VERSIONS: Ruby #/20 or less, Sapphire #/15 or less (No Stanton, Guerrero)*, Gold #/10 or less, Emerald #/5 or less, Black 1/1. CARD VERSIONS: Ruby #/20 or less, Sapphire #/15 or less, Gold #/10 or less, Emerald #/5 or less, Black 1/1. CARD VERSIONS: Ruby #/10 (No DiMaggio, Cobb, Ripken; Babe Ruth - #/5*), Sapphire #/7 (No DiMaggio; Ruth, Cobb - #/4*), Gold #/5 or #/3, Emerald #/3 or #/2, Black 1/1. JACKIE ROBINSON VERSIONS: Ruby #/20, Sapphire #/15, Gold #/10, Emerald #/5, Black 1/1. PARALLEL CARDS: Sapphire #/15 or less, Gold #/10 or less, Emerald #/5 or #/3, Black 1/1. Panini’s strengths and weaknesses are on display with Flawless. They have shown once again that there can be a fine line between high-end and boring. While many of the patches & cut signatures look super classy, the on card auto only cards tend to be mega boring. Since I’m hunting the on card, I’m not thrilled with the Flawless cards, but I’m still a buyer (of course). I think Panini and its customers would be well served with a major revamp on design for Immaculate, NT & Flawless. Open To Negotiating🔥🔥🔥2017 Flawless Box!! Diamond Infused Hits And $$ Cards! !